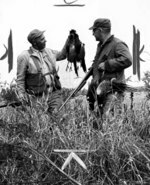 One of the great stories I heard as a kid growing up in southern Minnesota was the tale of my late father's first time duck hunting on Nicollet County's Middle Lake. Turning 13 in 1945, he was one of the younger brothers in a family of ten. All of his eligible elder brothers and brothers-in-law served in World War II; the war pretty much halted hunting with the soldiers gone and ammunition scare, or so my multitude of uncles told me while I was growing up. Troy, who had served in the Army in the Pacific theater, dragged his scrawny little brother-in-law along for the duck hunt. Troy and his brothers were prodigious wing shots who had done a little (ahem) market hunting in the Depression to help make ends meet. The skies were filled with waterfowl that fall, and my father never saw the like of it again. One of the subtexts of the story was the need of the men to get the spirit of war out of their systems. Things didn't go very well for the ducks or the game warden that perfect fall day, but the guys--all of whom had seen pretty horrific combat--felt cleansed through one of the few outlets they had in those days before we gained a better understanding of the needs of returning warriors. Minnesota soldiers returning from service outside the United States in the past two years are eligible for free hunting and fishing licenses from the Minnesota Department of Natural Resources (DNR). Returning soldiers, including those who served in the National Guard, may fish and hunt small game without a license for two years from their discharge. They may also obtain one free deer license under regulations passed by the 2007 Legislature. "Many Minnesota soldiers have put their hunting and fishing trips on hold while they serve abroad," said Mark Holsten, DNR commissioner. "The free license is a small way we can recognize their sacrifice, welcome them home, and extend an opportunity to be with friends and family in Minnesota's great outdoors." From the looks of that, hunters will still have to buy federal duck stamps; the DNR page on military/veterans licensing isn't clear about pheasant stamps. (Both are $5 each). We hope a peaceful day on the lake or in the deer stand brings some sense of the new normal to returning vets. And if they need more than that, help will be at hand.